There are 13 Assisted Living Facilities in the Plainfield area, with 2 in Plainfield and 11 nearby. The average cost of assisted living in Plainfield is $2,452 per month. This is lower than the national median of $3,346. To help you with your search, browse the 75 reviews below for assisted living facilities in Plainfield. On average, consumers rate assisted living in Plainfield 3.5 out of 5 stars. Better rated regions include Avon with an average rating of 3.9 out of 5 stars. Plainfield, which is a small town in central Indiana, has a population of nearly 33,000 residents. The 13 percent of residents that are over the age of 65 have just two assisted living facilities to choose from. Those who don't mind looking outside of Plainfield will find an additional 27 facilities in surrounding communities. In Indiana, assisted living facilities are officially known as Residential Care Facilities and provide at least one health-related service and two or more scheduled supportive services to at least five individuals. Facilities are licensed and monitored by the Family and Social Services Agency Division of Aging. Plainfield experiences four distinct seasons, with January lows around 20 degrees and July highs in the 80s. The summer months tend to have high humidity levels. The cost of living in Plainfield is a few percentage points lower than the national average which may appeal to seniors who have a tighter monthly budget. Indiana’s sales tax rate is 7 percent which is one of the highest state sales tax rates in the country. However, this is offset by the fact that Plainfield residents don't pay additional county or city sales taxes. While Social Security retirement benefits are not taxed in Indiana, income from pensions and retirement savings accounts are. 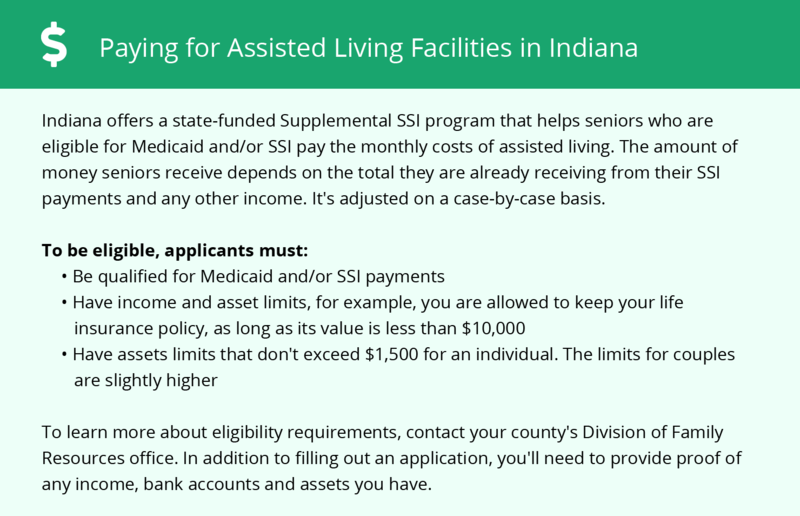 Seniors who are planning to live in an assisted living facility in Indiana should account for these taxes in their monthly budget. While the property crime rate in Plainfield is 14 percent higher than the state average and 20 percent higher than the national average, its violent crime rate is relatively low at 30 percent below the Indiana average and 26 percent lower than the U.S. average. Plainfield area is home to world-class medical facilities, including Hendricks Regional Health, in the event of medical emergencies or illness. Plainfield has an array of community resources for seniors, including the Plainfield Senior Citizens Service Program, an organization that provides medical screenings, transportation services and educational and social programs for seniors as well as one senior center. Assisted Living costs in Plainfield start around $2,452 per month on average, while the nationwide average cost of assisted living is $4,000 per month, according to the latest figures from Genworth’s Cost of Care Survey. 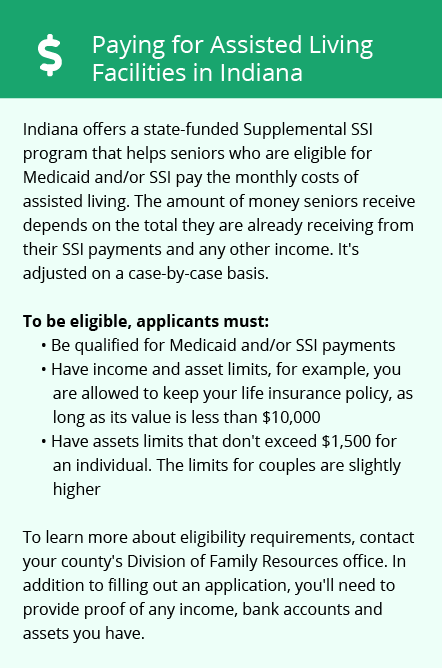 Low-income seniors in Plainfield can receive financial assistance from several programs to help pay for assisted living: Indiana Medicaid, the state’s Medicaid Aged and Disabled 1915 (c) Waiver program, the Indiana Residential Care Assistance Program and Supplemental Security Income. To see a list of free assisted living resources in Plainfield, please visit our Assisted Living in Indiana page. Plainfield-area assisted living communities must adhere to the comprehensive set of state laws and regulations that all assisted living communities in Indiana are required to follow. Visit our Assisted Living in Indiana page for more information about these laws.